Buying a newly constructed home from the footings up can be a very exciting time for the home owner because you are choosing the design, functionality and interior design of you new home. When you have made that all important decission to build a new home, there are many aspects that you must take into account. Let me help you through this daunting process to ensure that the dream home you have been dreaming about becomes a reality. With over a hundred of details to consider, I strongly recommend starting a binder dedicated solely to your new build so that you have everything in one place for easy access; I highly reccomend divising the binder into the following sections: Floor Plan, Materials, Electrical, Plumbing, Cabinets, Flooring, Paint etc... One of the most important items to address is to outline what your needs are; do you have a large family & tend to spend more time in the kitchen? If so, then the kitchen in your new home will take preference over all other rooms. Are you the type that will probably be entertaining frequently? If so, then you will need plenty of room with an easy flow design for that purpose. My suggestion is to meet with an accredited draftsperson who can take you through all the logistics that you will need to consider prior to the start of your new build. Make a wish list of all the items that you would like to have in your new home ready for when you meet with the designer. Choose where you want to build. Choose your lot and select your plan. If you wish to have a waterline ran for an icemaker, it has to be noted at the plumbing stages. Additional aspects of your new home build to consider are: placement of electrical outlets, pantries, island, lighting, number of bedrooms, basement design, wine cellars, garbage stations…(keep in mind recycling space), open concept verses divided space, lavatories, powder rooms, main floor laundry verses second floor laundry, garage no garage, closet space, what type of lighting would best suit your home & space, what kind of cabinetry & style would you prefer, what is the best color & type of flooring & then tie it all together with colors that suit your lifestyle & all within budget! If a new build is not for you, I can also assist in finding other homes throughout the greater St. John’s area that can suit your needs. No need to waste your time & gas by driving all over the city to find a new home. With the use of all the latest technology, tell me your wish list & I will pair you with homes in the area your are looking for right from the comfort of your own home! 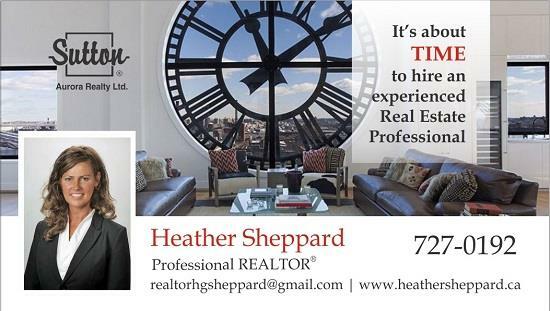 Call me today for friendly, reliable & hassle free Real Estate services.